IN A competition to decide which sport has the highest regard for its traditions, cycling would have to be a podium contender, writes Paul Cooper. 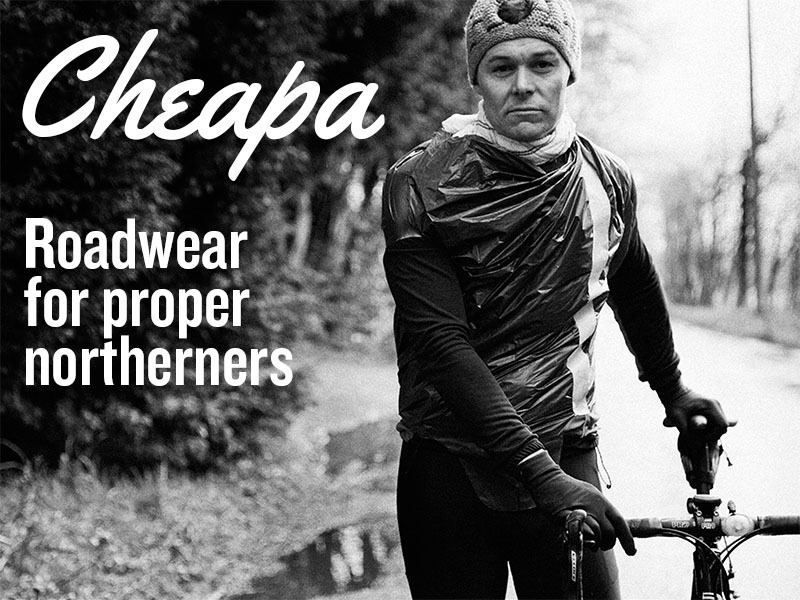 Today’s world of professional cycling is modern, high-tech, money-focused and slick. Yet the seemingly endless supply of cycling history books, welter of fans who appear to have read most of them and their almost reverential regard for bygone races and race heroes, mean that, in cycling, historic past often feels only a hair’s breadth from 21st century present. And if there is a place and time in the world of cycling where the two seem to edge even closer, that place is at the crest of a remote mountain road high above Lake Como in Northern Italy. Known as the Ghisallo Pass, it crosses the mountainous peninsula that divides Lake Como to connect the elegant lakeside town of Bellagio with the historic city of Como. The time is Il Lombardia race day – the arduous end of season monument sometimes lyrically called the ‘Tour of the Falling Leaves’. The crest of the Ghisallo Pass is reached after a tough six-mile climb from Bellagio. Snaking its way from the lake and negotiating more than 20 hairpin bends, it offers tantalising glimpses of the Italian and Swiss Alps until the final ramped section enters the hamlet of Magreglio. As it does, it passes the small wayside chapel of the Madonna del Ghisallo. Dominated by a tall bell tower, the chapel – and one of only a handful of buildings in Magreglio – marks the crest of the climb as the road levels before its long and steady descent towards Como. This is no ordinary wayside chapel. No matter what changes are made to the demanding route of Il Lombardia, it always includes the Ghisallo Pass. 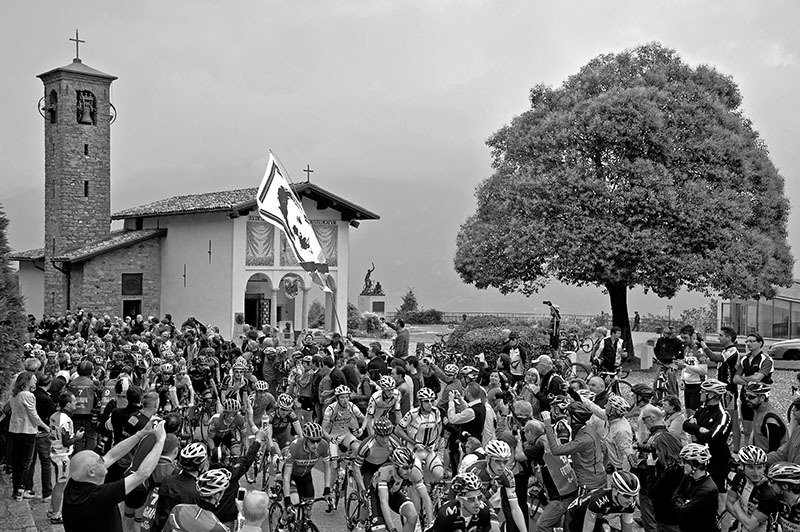 Here often proves crucial to the outcome of the overall race and the peal of the chapel’s bells, perched directly above the final stages of the climb, is synonymous with announcing the arrival of the riders to the many waiting fans on the mountain and is an annual feature of Italian sporting life. 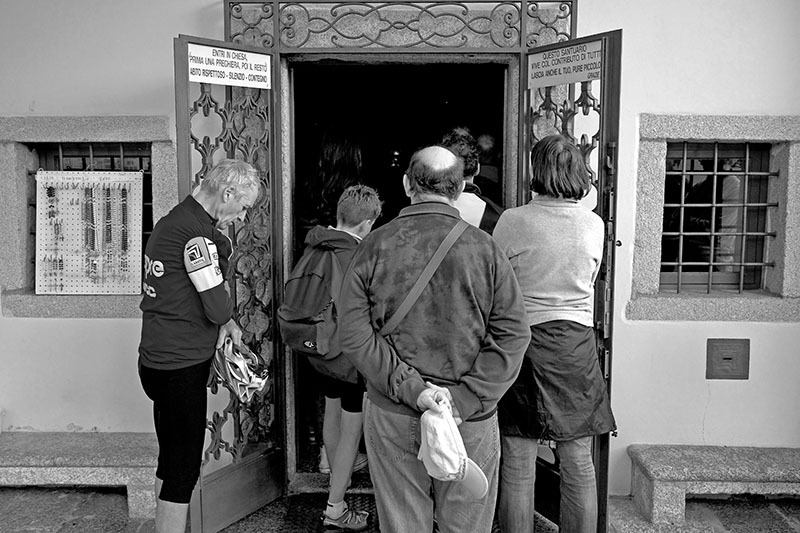 Visited by no less than three popes, the chapel is a place of pilgrimage for cyclists throughout the world who have adopted the Madonna as their patroness. The chapel’s origins can be traced to the 12th Century. Legend has it that, crossing the remote mountain pass, the Count of Ghisallo was threatened by bandits. Making his escape, he sought refuge at a wayside shrine to the Madonna. He prayed desperately to her until she appeared causing his attackers to flee. Deeply grateful, he made and honoured a pledge to enhance the shrine. In 1645, the small church was built and a painting of the Madonna and Child installed. It still hangs above the altar today. The reputation of the Madonna as a protector of vulnerable travellers grew with every local retelling of the legend. But it was not until 1905, when the specific association with cycling began to emerge. It was then that the first edition of the Giro di Lombardia (as it was then called) passed the chapel, making known the chapel’s existence to cyclists and cycling fans throughout Italy. The location of the chapel, at the highest point of a tough climb, with breathtaking views to Lake Como, Switzerland and Milan, as well its association with protecting travellers, endeared it to cyclists. They began to make devotions of their own and prayed at the chapel for racing success and for protection from the perils of their sport – leaving votive offerings, including race jerseys, bikes – on which they had won major races – and other sporting trophies. By the golden age of Italian cycling in the 1940s, the chapel and its growing collection of cycling artefacts, as well as its devotional link to the sport, were becoming well-known in Italy. Crucially, it was then that a Jesuit priest, Father Ermelindo Vigano, began his 41-year period as Magreglio’s parish priest. 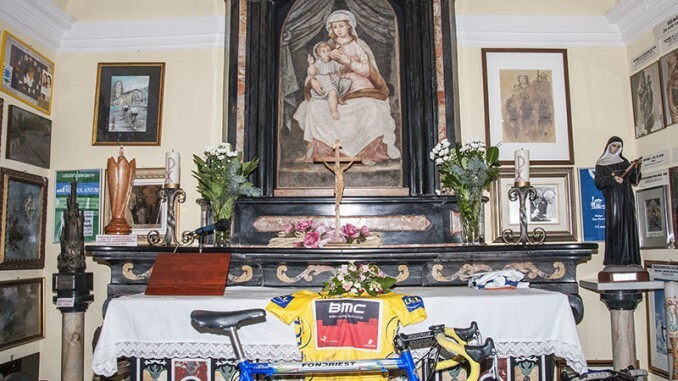 A devoted cycling fan, he welcomed cyclists to the chapel – some top Italian riders even married there – and he established a small cycling museum. The Pontiff also blessed the chapel’s sanctuary lamp at his summer residence in Castel Gandolfo. 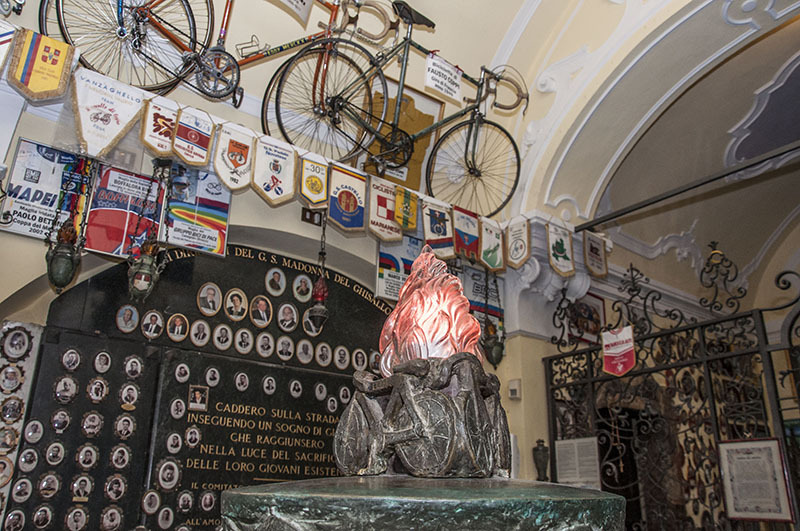 Entitled the ‘Permanent Flame of the Ghisallo,’ the flame was then transported by cyclists, including rivals Fausto Coppi and Gino Bartali, in a relay ride to its mountaintop destination. 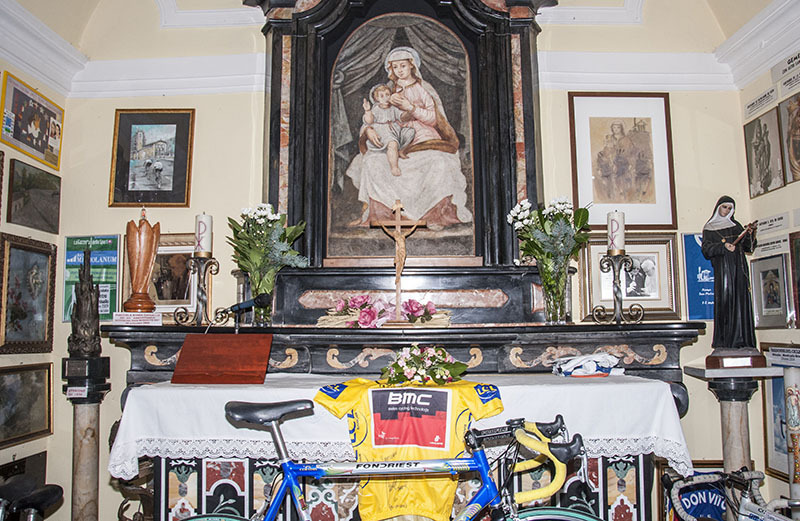 Inside the chapel is like few other places of worship – both a shrine to the Madonna del Ghisallo and a veneration of the history of the sport of cycling. Its walls are weighted with cycling memorabilia – both fascinating, and deeply touching. Bikes that record a rivalry that once divided Italy, those of Fausto Coppi and Gino Bartali, sit close to each other; a bike ridden by Eddy Mercks in the Tour de France is there, as is the bike ridden by Alfonsina Strada. Little known now, in 1924, Strada, aged 34, became the only woman ever to ride in the Giro d’Italia, completing every inch of the 2,245-mile race without team support. There is a poetic tribute to Marco Pantani. And, perhaps most poignantly of all, there is the bike ridden by Como’s son, Fabio Casartelli, on the day of his tragic death on the on the Col de Portet D’Aspet in the 1995 Tour de France. On race day this year, in true mountain-top form, the crowd was deep, noisy, multi-national and poised to surge to the riders when the chapel bells heralded their arrival. Amongst them was a group of Scottish riders combining a cycling trip to the area with support for Il Lombardia. Jim Watson, from Lanarkshsire’s Coatbridge Clarion, said: “The climb up here was tough, but great and when you see the history in the chapel it’s just fantastic. For the many riders from local Italian clubs, there was an unmistakable feeling of special annual reunion – a time to meet up with old club mates and review the season. Davide Perere, from Pedale Bellanese of Como, said: “Every time there is a race of importance, like the Giro d’Italia or Il Lombardia, Pedale Bellanese riders come up here. A significant experience of another kind belonged to Radu and Elena Arsene, from Magreglio. 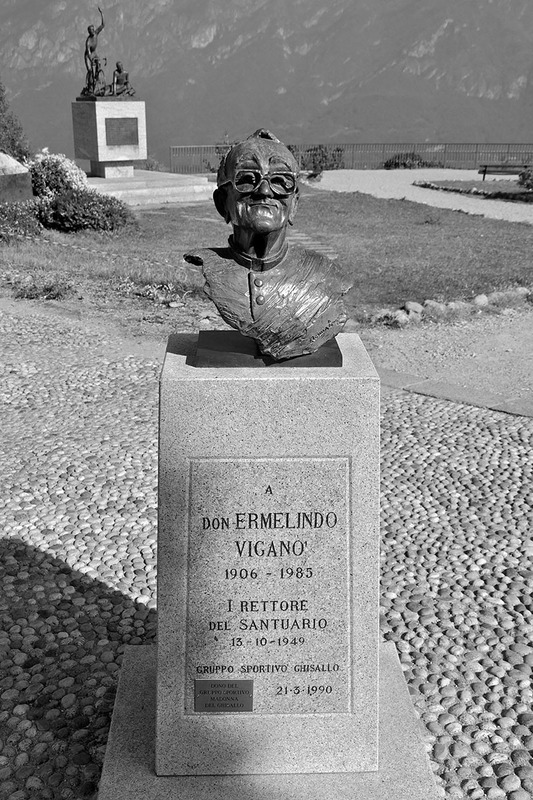 Married on the day of Il Piccolo Lombardia (the shorter race for under-23 professional riders, which runs on the day preceding Il Lombardia) they made a detour to the busts of Fausto Coppi, Alfredo Binda and Gino Bartali, which guard the chapel entrance, and where Radu, a keen cyclist, was keen to record their marriage vows. This October, Il Lombardia was won by Ireland’s 28-eight year-old, Dan Martin. After crossing the finish line in dramatic fashion in Bergamo, he spoke warmly about the traditions and beauty of the race and the part played by the Madonna del Ghisallo chapel in perpetuating that beauty. Telling of his many prior visits, he described passing the chapel during the race as a very special experience. So it’s all there – spectacular landscape, sport, spirituality, excitement, camaraderie and community. All intertwined with the commemoration of fallen riders and celebration of a bygone, golden age of cycling. Each year, as the Tour of the Falling Leaves draws the European pro-season towards its close, his words ring true with the peal of chapel bells high above Lake Como. Thanks Paul! It was nice to meet you up there with all others cycling passionate!!! !